We had walked over from her place on Benton Way in the late afternoon and stopped into a bright Mexican restaurant and sat at the bar where they had expensive tequilas and cheap margaritas. At El Cóndor, on Sunset at Edgecliffe, the bartender was tall and black and efficient, fast serving the cold, salted glasses with the green mixtures to go along with the guacamole and chips. We were talking and then a young guy sat down at the corner. 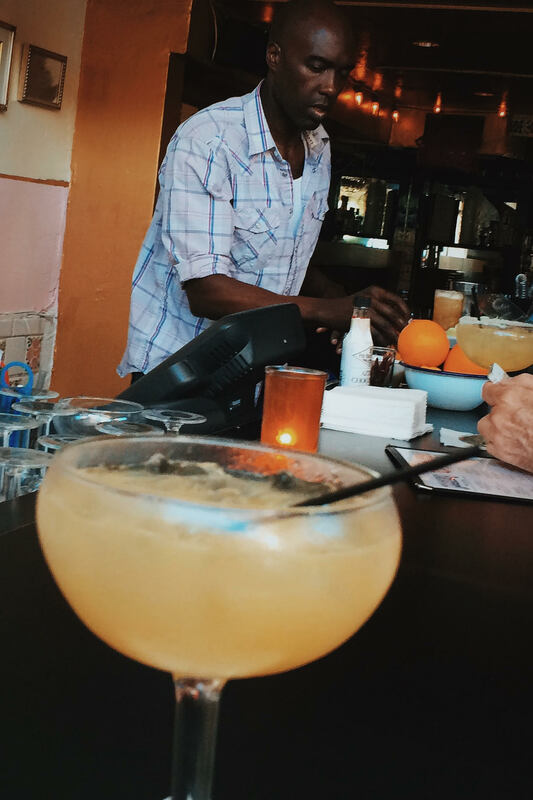 The server, the busboy, and the bartenders seemed to know him as if he were a regular. He talked to a blond, bearded bartender, who left, and was replaced by a clean- shaven, quiet bartender in a denim shirt. “I moved in with a girl,” he told the quiet bartender who listened and nodded politely and stared into the distance. “I came here to act,” he said. “I’m going to a party later,” he said. He was looking for a friend, maybe something more, but his plaintive loneliness reminded me of so many days and nights ago, and that certain summer twenty years ago when I moved to Los Angeles and lived with a girl. There was nothing to the relationship, other than a brittle friendship, and it died in the fall of 1994, never to return. When you drink, you think, and you are articulate. The intuitions and insights flood your mind, and you feel relaxed and the fear and the anxiety leaves you and you can walk and laugh, cry and remember, and nothing will stop you, no inhibitions or tentativeness, no wary caution or reversion to propriety. And the next day, if you are lucky, you remember a tiny portion of last night’s enormous revelations. After we got back to her place on Benton Way, she told me I was her first activity of the night. Jason was downtown, visiting from Montreal, and she would be driving there to meet him. But first she showed me those crazy, 1980s sweaters I gave her that had once belonged to my late Mother. She said they smelled like Louise, who died on September 1, 2014. My mother always dry-cleaned her clothes and hung them on wire hangers shrouded in plastic. We sat on the gray sectional couch that had been in my mother’s apartment on Admiralty Way in Marina Del Rey, the couch that had been purchased at Crate and Barrel in Paramus, NJ on Route #17 in the summer of 2008, the couch that was selected as I pushed my reluctant father in a wheelchair around the store and my mother hobbled along. That couch covered the events of the last seven years, the deaths of its two owners. 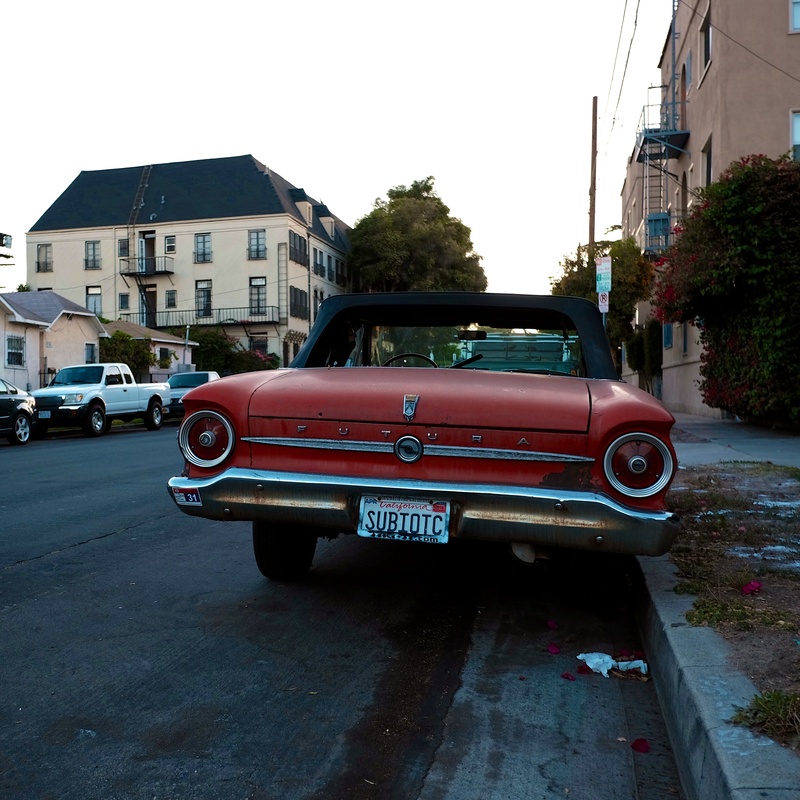 It lived to find a new home in Silver Lake. 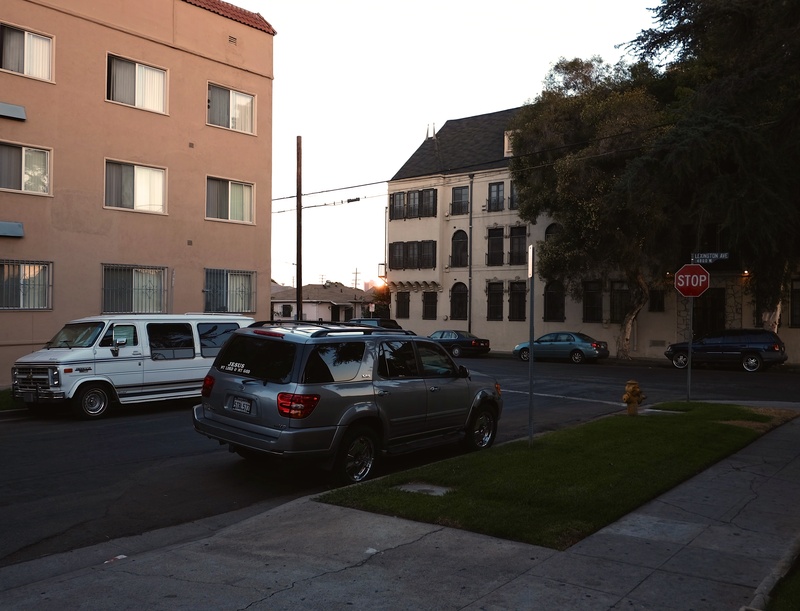 We are not more than friends so I left to make way for love, which was fine, as I was happy to drive into the waning light and go back to a street I found a few months ago where the giant Church of Scientology looms over a motley block of cheap apartments. That street was Berendo, near Lexington, and I found it just when the sun was setting, and the harsh ugliness of old, broken-down, and neglected buildings became comely, enticing and seductive. There were markers of Western history dropped onto the streets, like French chateaus and Spanish castles. 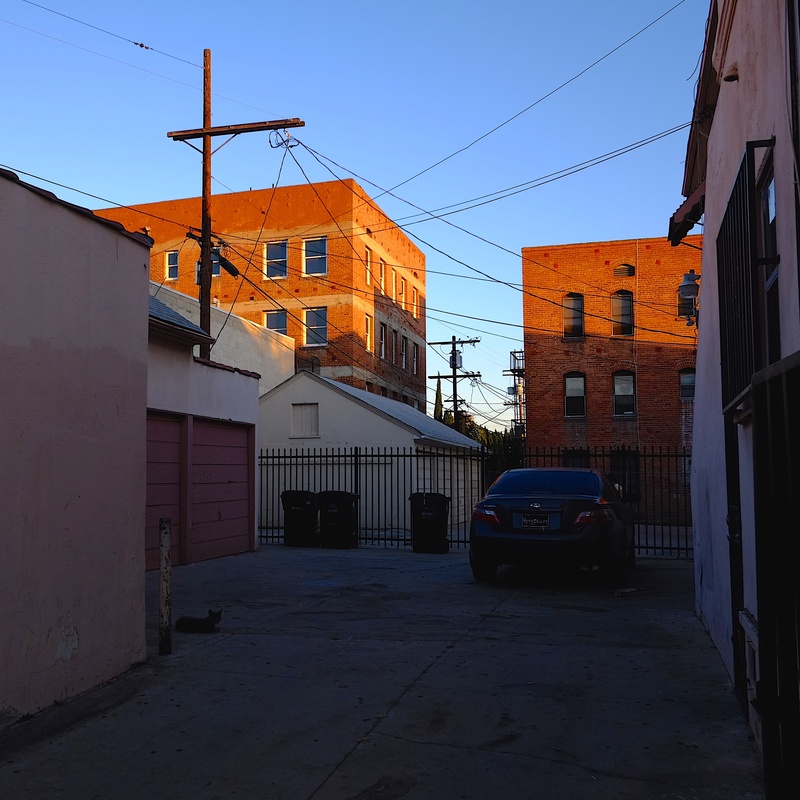 There were homely, plain and workaday brick and wood apartments and houses, old wooden electrical poles and wires, and cars that were packed into tight alleys, and parked along the curb. Occasionally, a cat would crawl out from under a car and dart into another shadow. Berendo was blasphemy, watched over by a cross atop on an old blue hospital now advertising SCIENTOLGY. Under the gaze of the cult, I was walking, and photographing, a city unique in its fate and form. Los Angeles: the most photogenic city in the world. Whatever you imagine it is, it is. Her beauty is fragile and fleeting. Her people arrive to grab onto to something illusory and transforming. She should be seen and felt in the fading light, after the hours when the sun is brightest and before the hours when the darkness descends. Church of Scientology HQ was not a hotel. It was Cedars of Lebanon Hospital. 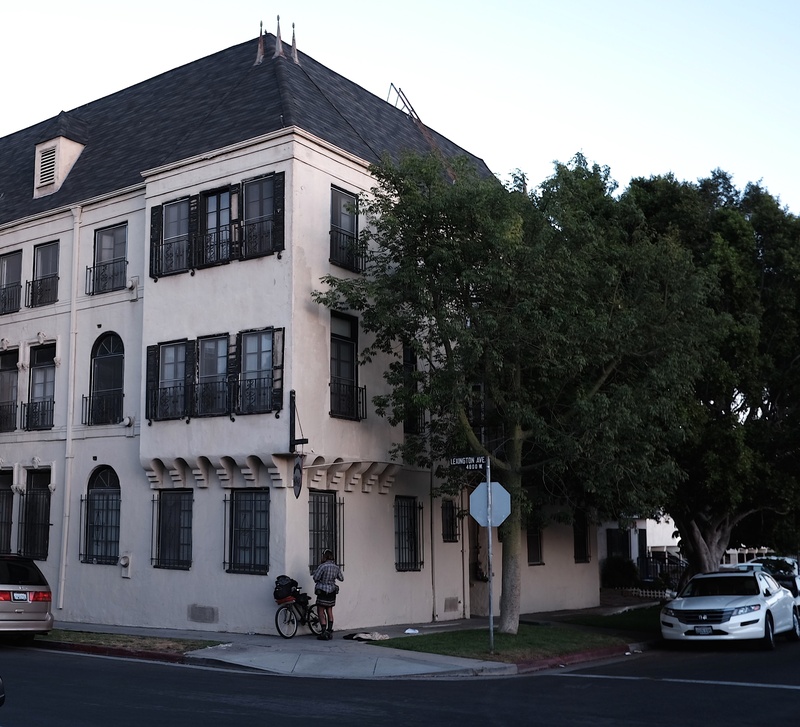 Andrew, what you refer to as an “old blue hotel” that now has the Scientology sign on it was actually Cedars of Lebanon Hospital before it merged with Mt. 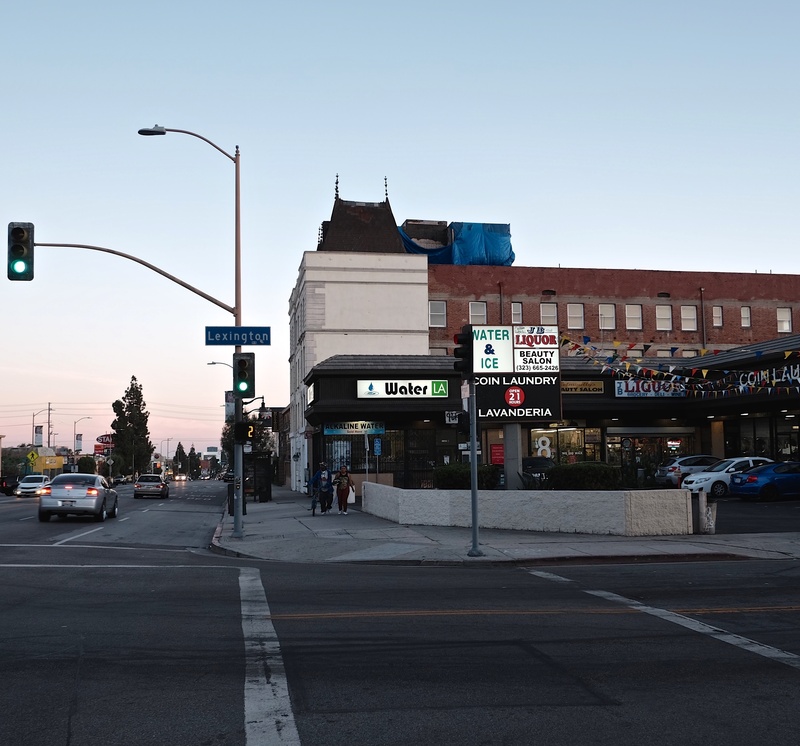 Sinai Medical Center and moved to West Hollywood to become Cedars-Sinai Medical Center. 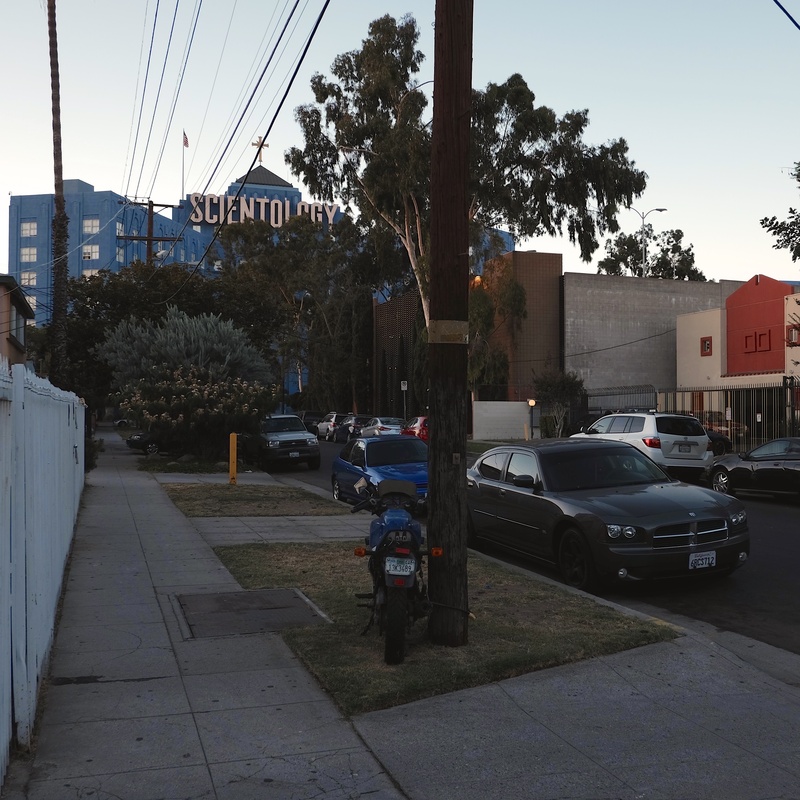 I was born there and each time I drive by and see the Scientology center on the building where I was born, I grind my teeth. Thanks for the clarification Robert. Now it really is a hotel or an asylum. Beautiful posting, Andy. Your writing is so poetic. Love it. And thanks for coming out to Benton Way last night. Great to see you.